I'm a visual learner, so I also tend to be a pretty visual teacher. 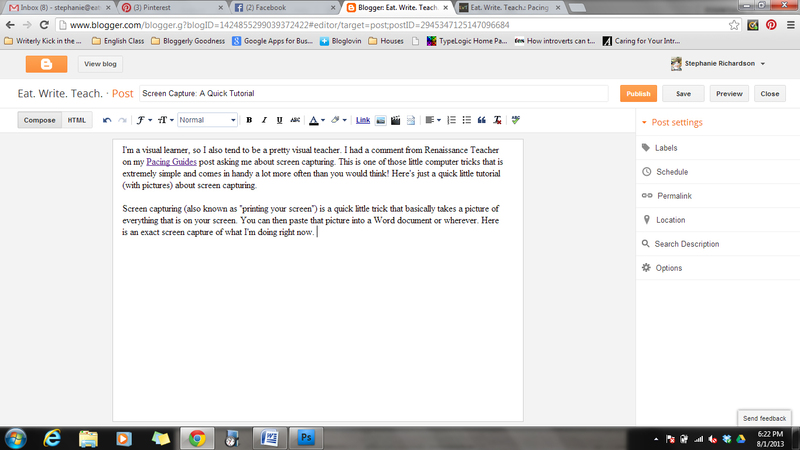 I had a comment from Renaissance Teacher on my Pacing Guides post asking me about screen capturing. This is one of those little computer tricks that is extremely simple and comes in handy a lot more often than you would think! Here's just a quick little tutorial (with pictures) about screen capturing. 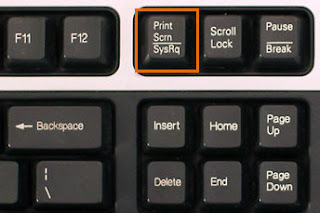 Screen capturing (also known as "printing your screen") is a quick little trick that basically takes a picture of everything that is on your screen. You can then paste that picture into a Word document or wherever. Here is an exact screen capture of what I'm doing right now. As you can see, it's a picture of my computer, including the tabs at the top and the bar at the bottom. 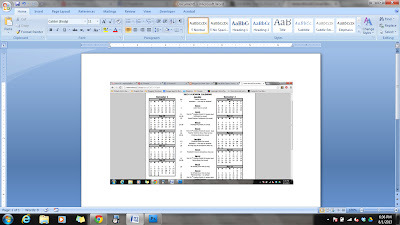 As I shared in my last post, I use this little screen capture tool to help make my pacing guides. 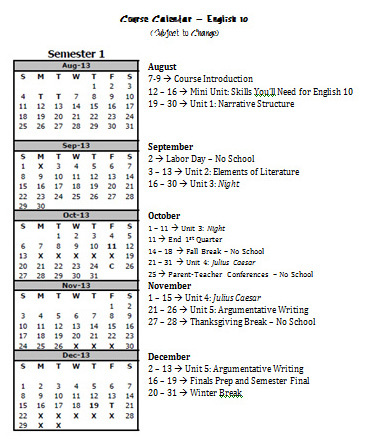 I start by opening the PDF document of our school corporation calendar. I zoom in or out on the screen to best display what I want to capture, and then I hit the Prnt Scrn key on my computer keyboard. You will likely be able to find this button somewhere above or around your Backspace key. 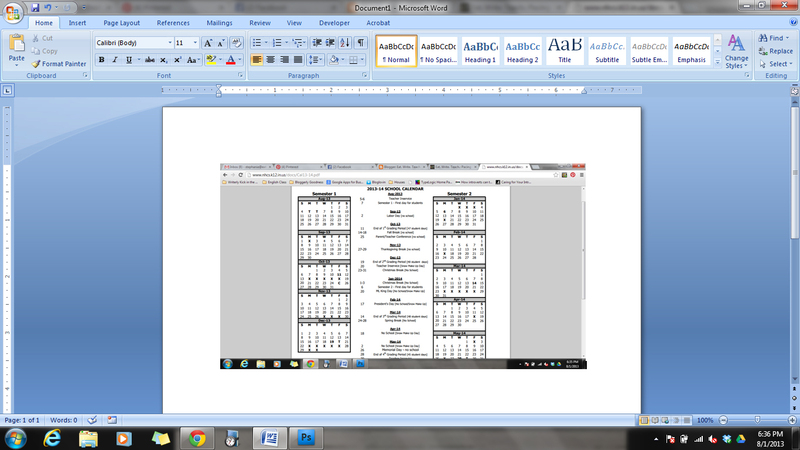 Now, open up a Word document and click Paste (or Ctrl + V). 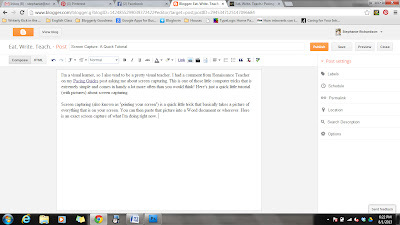 Your screen shot should appear in your document. Yeah, I still have Word 2007 on my laptop. Don't judge me. Ta-da! You have a picture of your screen, and you can manipulate it like a picture. 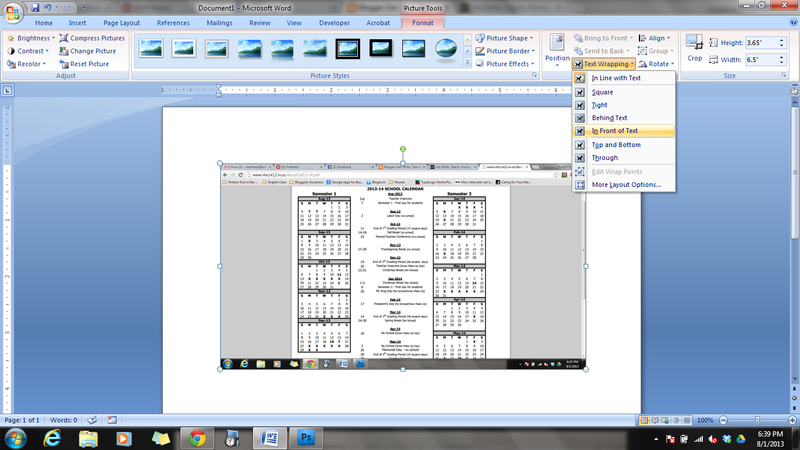 The first thing I always do when manipulating a picture in Word is to change the text wrapping. Double-click the picture, find the icon of the little dog on the horizontal striped background (labeled Text Wrapping) and choose In Front of Text for the most flexibility. Once I've done that, I crop the picture. Choose the Crop tool and drag the sides and corners to cut off pieces of the picture. 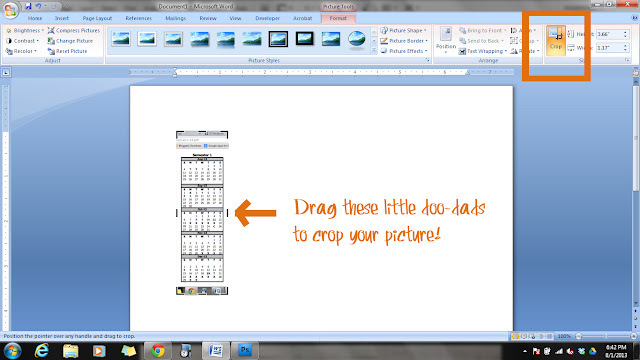 Now that I've got half of the calendar like I want it, I can plug it into my pacing guide! Let me know what other little tricks you guys would like to learn! I'll see what I can come up with for you. Stephanie is an English teacher by day, a YA Fiction writer by night, and a foodie always. She blogs about her adventures in the classroom, offering ridiculous anecdotes, unsolicited advice, and silly GIFs, all sprinkled with healthy doses of sarcasm and profanity, in the hopes that it might make the daily life of other secondary teachers just a little bit easier. I'm having a lot of very annoying trouble with spam comments right now, so I've had to add the word verification thingy. Sorry it's such a pain, but I still love you! Keep the comments coming! This is my personal blog. The views on these pages are mine alone and not those of my employer, my husband, my hairdresser, my parents, or my dog. Feel free to use the comments section of each post to disagree with me, challenge me to a duel, or taunt me with an outrageous French accent, you silly king, but I reserve the right to delete any comment for any reason whatsoever (abusive, profane, rude, annoying, spam...), so let's all be friends. Also, please remember that this is, in fact, a blog. I do not claim to cure what ails you in your classroom or in your life. I just hope to offer advice that makes life a little easier. 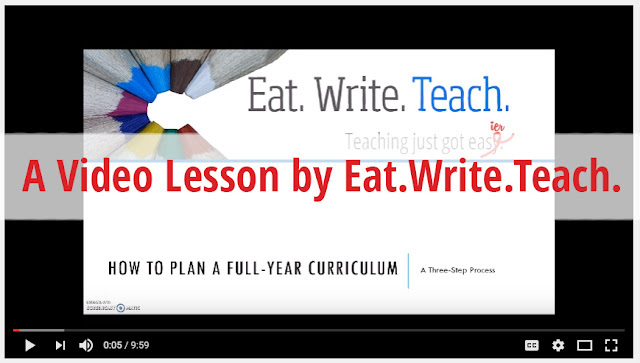 Unless otherwise noted, all content on this website belongs to Eat.Write.Teach. If you borrow, please link back. Thanks!